I bought fabric with the intention of making cloth napkins. I'd been looking at other blogs and seeing all these napkin-making tutorials. I was enthralled with all the beautiful face-wiping collections that I was seeing. All I could think about was buying cloth. To make into a square. That I could wipe my face on. That's when I realized that I didn't want to make napkins out of the colorful fabric, because it was too colorful (that's what I told myself, but really I just wanted to make something else with the material). But there was still the dilemma of napkins. I'm kind of a perfectionist and the thought of making napkins that weren't perfectly square was stressing me out. A lot. I kept thinking about it, but I couldn't bring myself to buy fabric. Partially because of my fear that it would turn out asymmetrical, and also truth be told because I have several other sewing projects in progress right now that are at present sitting out... (not being sewn). One of my rules is to finish something before I can start something else. I guess it's more of a guideline than a rule. I don't always adhere to it, but this time I had resolved to fulfill that decree. Must. Refrain. From Going. To Look. At Fabric. Then, we went on vacation to visit family. One of the days we were there the ladies and I escaped for a girl's expedition to some local thrift shops and one fantastical antique shop. I was looking around for about fifteen minutes before my aunt said to me, "This is just the first room. There are at least a dozen more back this way..."
There were antique tablecloths, depression glass, embroidered hand towels, furniture, postcards, tools, figurines, jars, bottles, glassware, cameras, utensils, dishes, toys, fabric, and anything else you can imagine. It was a treasure trove. As I meandered through, it occurred to me that perhaps they might have some napkins. I walked over to the gentleman who was working and asked if they by chance had cloth napkins anywhere. At that a broad grin spread over his face. He said, "I have two suitcases full to the brim with napkins that just came in. I will get them and you may have first pick." When he brought them out he told me they had come from an estate sale - all from the same house. There were so many. It was hard to choose! When I left I had an armful of napkins though. It definitely wasn't impossible to choose! 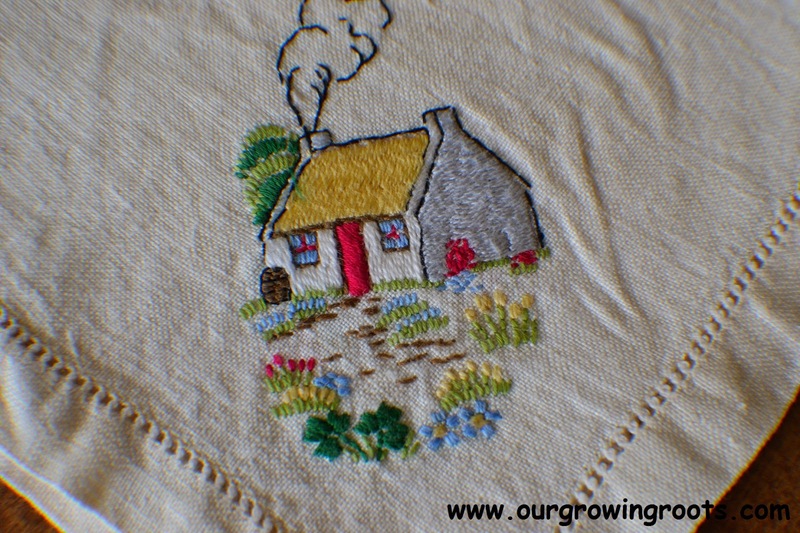 I particularly fell in love with the napkins that had these little whimsical pictures hand embroidered onto them. I just know I will love wiping my face on these more than the others. One of the best parts - well in addition to the obvious fact that we acquired some nice reusable napkins - was that they were not expensive. In fact, I didn't spend any more on these than I would have had I bought cloth napkins at the store. I spent less. That was exciting to realize. It was not as cheap as it would have been to make my own using inexpensive material, but honestly I like them more. I consider that a win. I am so happy to give these napkins a new home. I think the kids will also truly enjoy the napkins with the pictures. And if not, at least their faces will be clean. I love the napkins you bought - they are fabulous! BUT - I have to say I have never looked at a napkin on my lap to see if it were perfectly symmetrical - I think they all do a pretty good job wiping my face regardless!!! Lol. Those are so cute! I would love wiping my face on those cute pictures too! Seriously! I can't imagine who wouldn't! They're just ridiculously cute! 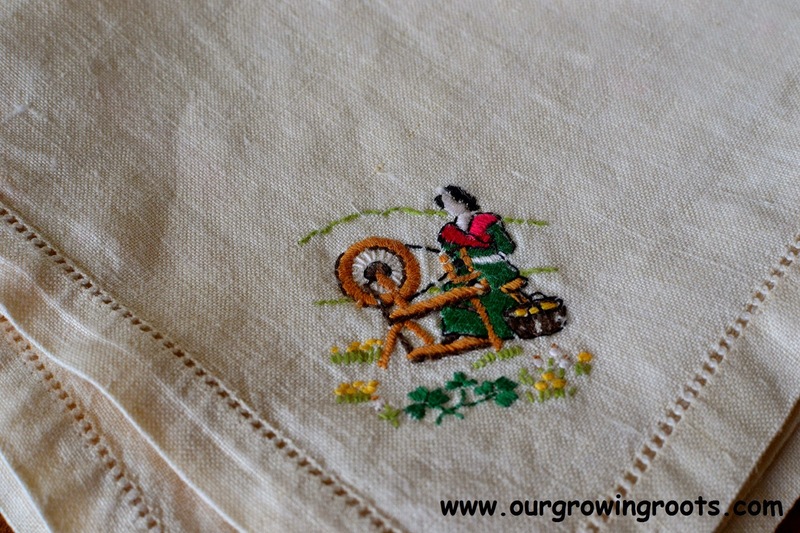 those are lovely embroideries. Great find! Thank you! I aspire to be able to embroider like this in the future. I have to imagine it is fun to make pictures like this with your own hands. 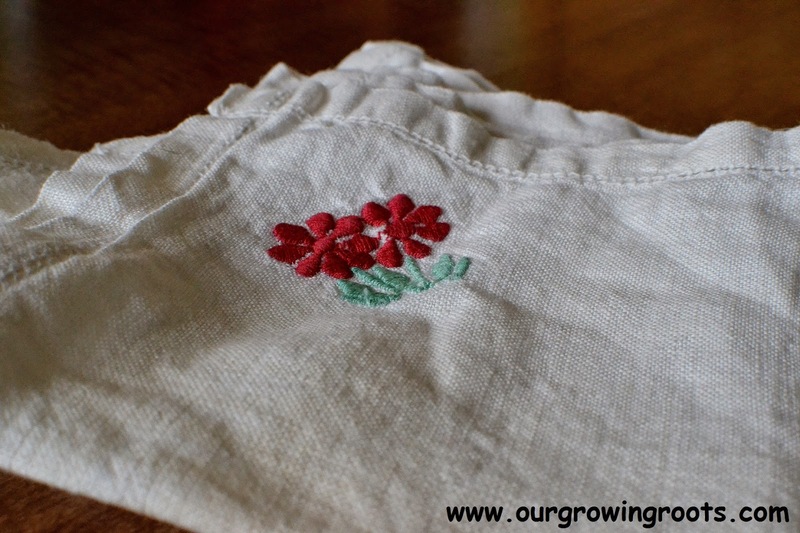 So much lovelier than new napkins, even homemade ones. And I think I would have loved to come and visit that shop with you! I always find it hard to understand why people prefer to pay more for new, when pre-loved is so often better quality, more long lasting, full of wonderful history, beautiful and cheaper - as well as being a greener option too. It makes no sense to me! Yes! "Wonderful history" that is what I keep wondering about. I love antiques, because it makes me wonder about the back story. Who embroidered them? Who were they for? It's a mystery, and who doesn't love a mystery? I would have loved to have gone antique shopping with you! It really was an amazing place. Oh my gosh that sounds like my kinda shop! Those napkins are just gorgeous. I love how someone's taken such care over creating and looking after them. It was the kind of shop that you could literally get lost in for hours. Pretty much awesome. Those napkins are so pretty. My favorite one is the house. I love napkins too. 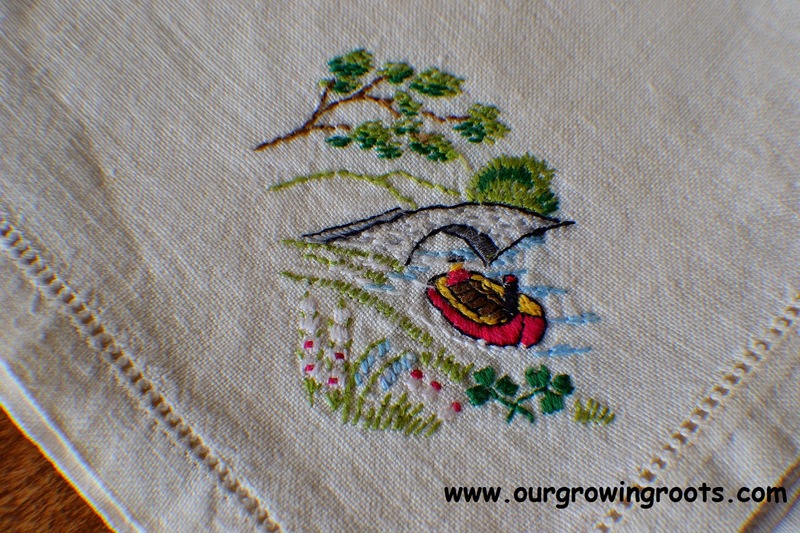 When I was Italy, I brought several embroidered napkins. I also love fabric, even though I can't sew….go figure. I LOVE the house. There are actually a couple with pictures I didn't post that are as equally adorable. But, the house. That one is probably my favorite too! Oh, they're cute! What a great find! I've thought about making my own napkins too, but I haven't even gotten as far as buying the fabric. Maybe I'll do what you did and just scout some local thrift shops. It was definitely an exciting find! I think I would have been happy to make some as well, but I'm glad I found these. It was kind of like finding hidden treasure. Adorable napkins, good choice! I also enjoyed your rule of not starting one thing until you finish another. Something I probably need to adopt!